Photographer Roland Miller has made it a mission to document space launch sites abandoned across America. Launch Pad and Gantry with Hermes A-1 Rocket, V2 Launch Complex, 33 White Sands Missile Range, New Mexico 2006©Roland Miller. Used with permission of Roland Miller. The 1950s in America were a time of brightness and hope. The war was over, the world was in recovery, and the time had come to look to the future — in particular, space: that wonderful, shining, final frontier (inspired, in part, by war engineering efforts). Even better, there was a competitor motivating the US efforts — its former ally, now foe, Russia. The space exploration program boomed, with launch sites blossoming across the country. Throughout the late 1950s and the 1960s, both nations achieved great things — but, in July 1969, when America landedApollo 11 on the moon, it spelled the end of the race. Such a large number of launch facilities were no longer required; and, over the next two decades, most of them closed, one by one. It is these empty monuments that have captivated photographer Roland Miller, who has spent over 25 years photographing space programs and astronauts. Sunrise, Launch Complex 34.© Roland Miller. Used with permission of Roland Miller. “Abandoned in Place,” he said, was created almost by accident. “I was consulting an environmental engineer from Cape Canaveral Air Force Station regarding the proper disposal of old photographic chemicals that had been found at a building the Air Force was renovating. He took me to see Launch Complex 19, the Gemini Program launch facility, and I knew instantly that I wanted to photograph this facility and others that were on Cape Canaveral,” he explained of the project’s genesis. Wind Tunnel Test Chamber with Model, 7 X 10 Foot Wind Tunnel, NASA Langley Research Center, Virginia 1997©Roland Miller. Used with permission of Roland Miller. It’s not, he says, merely the beauty of the sites, but also their place in the history of space exploration and cultural significance. “I was drawn to photograph these launch pads and research facilities for many reasons. Obviously their history made them worthy of documenting years after their useful life had ended. The colour aspects and unique design made them visually intriguing. The fact that these sites were once the focus of the world’s attention and now were abandoned reminded me of the temporal nature of life,” Miller said. Named for a notice NASA sprayed onto a wall at Cape Canaveral Air Force Station Launch Complex 34, his collection of photographs has toured the US and is now being collated into a Kickstarter-funded book containing around 100 colour photographs from the series — a way to preserve the sites, many of which have since been demolished. Miller estimates that around half the facilities he photographed for the series no longer exist — torn down to remove the costs of maintaining and securing them. And it’s not as if anyone can just visit one of the remaining launch pads for themselves, either. 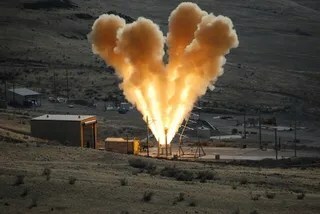 “You have to understand that all of these launch complexes and test sites are on secure military bases or NASA and contractor operated facilities with numerous security considerations and hazardous operations,” Miller explained. The images themselves are poignantly beautiful — the sites reminiscent of ancient, crumbling, monumental wonders. The photographs will be accompanied in the book by poems by sci-fi author Ray Bradbury and essays by art historian Dr Betsy Fahlman, aerospace journalist Craig Covault, retired NASA astronaut Colonel Pamela Melroy and space archaeologist Dr Beth O’Leary. Launch Ring, Launch Complex 34, (Apollo Saturn), Cape Canaveral Air Force Station, Florida, 1990© Roland Miller. Used with permission of Roland Miller. Abandoned in Place is due for a release in August 2015, published by the University of New Mexico Press. Interested parties can email Roland Millerfor updates and more information, and more pictures can be found on the Abandoned in Place website. ABANDON IN PLACE/PEACE, Launch Complex 34, (Apollo Saturn) Cape Canaveral Air Force Station, Florida© Roland Miller. Used with permission of Roland Miller. The skull of the “Vampire of Venice” was found in a mass grave with a brick stuck in its jaw. The mystery behind several “vampire” burials in Poland has been solved. People who were buried with sickles (curved, sharp farming knives) around their necks, or rocks at their jaws, to prevent their corpses from reanimatingwere natives to the area in which they were buried, according to a new study. Tales of the dead coming back to life have truly ancient roots, going back to the ancient Egyptians, Greeks, Babylonians and beyond, said study co-author Tracy Betsinger, a bioarchaeologist at the State University of New York at Oneonta. For all these stories of the dead coming back to life, “the word collectively used is a ‘revenance,’” Betsinger told Live Science. Tales of vampires have circulated in Eastern Europe since at least the 11th century, and newspaper accounts have described alleged vampires since the 17th century. For instance, in 1725, an Austrian official recounted the story of Serbian peasant Petar Blagojevic, who was said to have killed nine villagers in his area before people staked him through his heart. Vampire lore at this time didn’t require blood sucking as an integral feature; instead, the undead could slay living people with just a glance. In ancient lore, a person was at risk of becoming a vampire after death if he or she was unbaptized, died a violent death, was the first one killed in an epidemic or was an outsider from another local, Gregoricka said. Notions that vampires drank blood may have arisen during plagues and epidemics, when corpses would often lie exposed and decomposing for long periods of time. “People were up close and personal with death at this point, but didn’t have a good way to explain what was happening,” Gregoricka told Live Science. For instance, the body tends to bloat after death from bacterial-produced gases. This pressure in the lower body, in turn, forces blood up from the lungs, into the esophagus and then through the mouth, which may have led villagers to believe the corpse of a person who was waiflike and frail during life was fat from feasting on blood, she said. The researchers then took a closer look at 60 of the 333 burials from the site, six of which were “vampire” burials intended to prevent a corpse from reanimating. The team analyzed the ratio of strontium isotopes (versions of the atom with different numbers of neutrons) in the skeletons. Because each location has a unique ratio of these isotopes, and people’s bodies naturally take the elements up from the environment, analyzing strontium isotope ratios can reveal where a person is from. Contrary to the initial hypothesis that the “vampires” were immigrants, the team actually discovered that all of the vampires were locals. Since none of the “vampires” showed signs of a violent death or severe trauma, the team speculates that the vampires were perhaps the first people felled in one of the cholera epidemics that swept the area during the time. People could die of cholera in days or even hours, Gregoricka said. “If something kills you very quickly, it’s not going to leave a mark on the bone,” Gregoricka said. As a follow-up, the researchers want to conduct more chemical analyses to see if they can learn more about these villagers. The findings were published today (Nov. 26) in the journal PLOS ONE. Follow Tia Ghose on Twitter and Google+. Follow Live Science@livescience,Facebook & Google+. Originally published on Live Science. 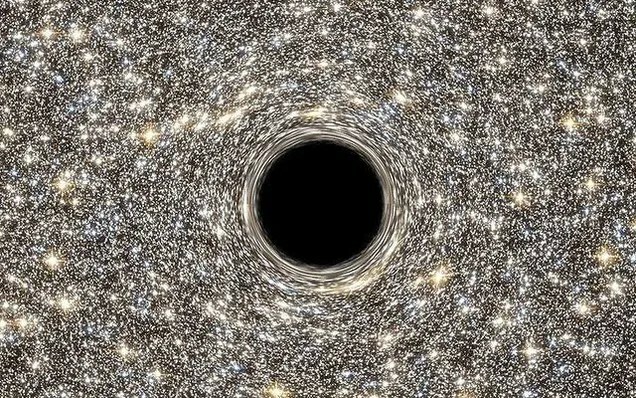 You probably already knew today is Black Hole Friday. 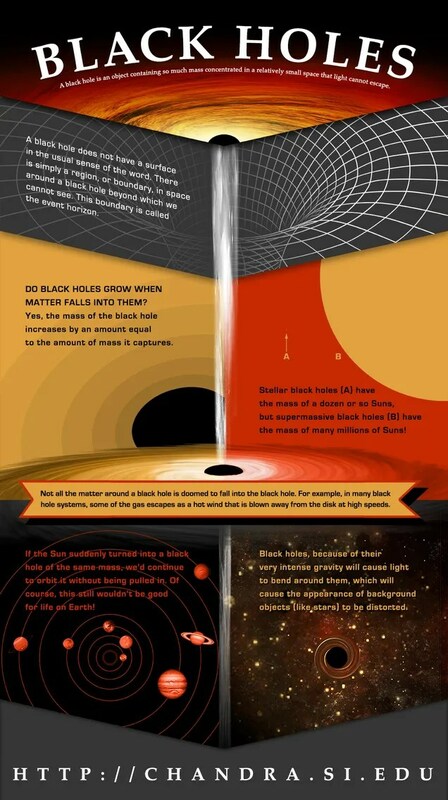 To celebrate, NASA and other agencies have been posting black hole stuff. 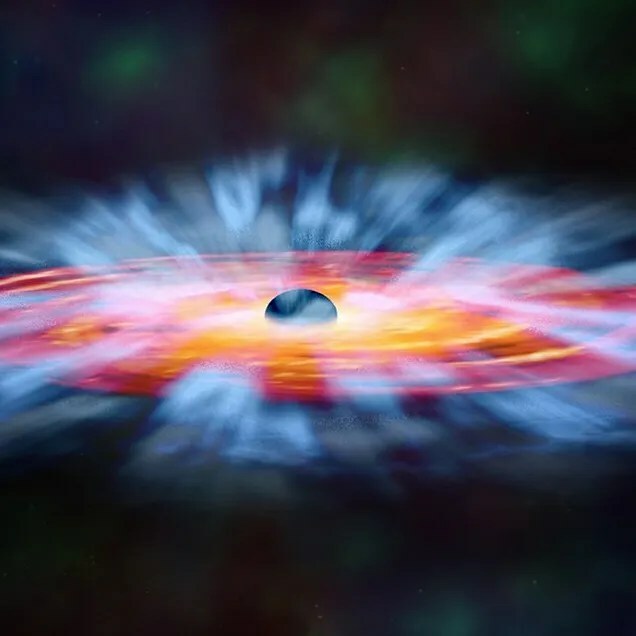 Like the above, an artist’s conception of a black hole five times the mass of the one at our galaxy’s center, in a superdense galaxy 1/500th the diameter of our own, the M60-UCD1 dwarf galaxy. And here’s a gorgeous image of NGC 1313, or the Topsy Turvy galaxy. 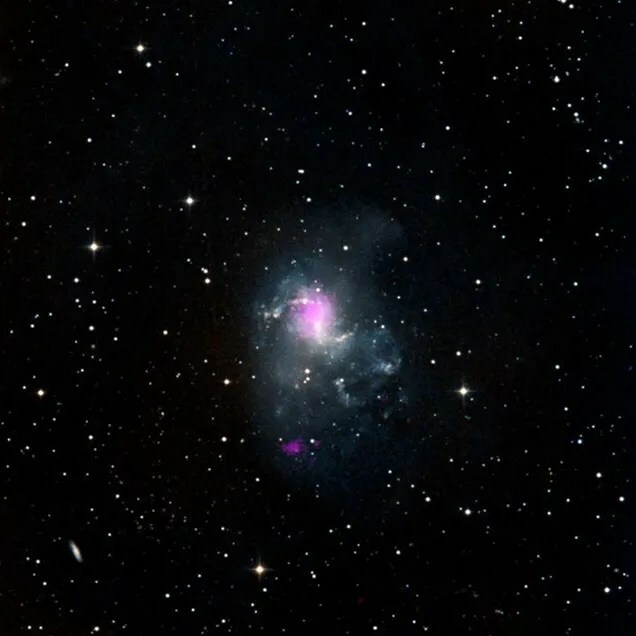 The two magenta spots in the galaxy represent two black holes. 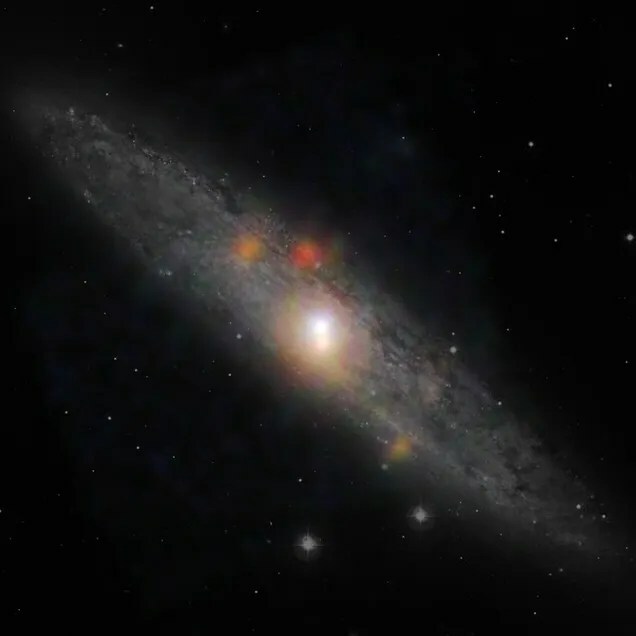 The “slumbering” black hole at the center of the nearby sculptor galaxy. 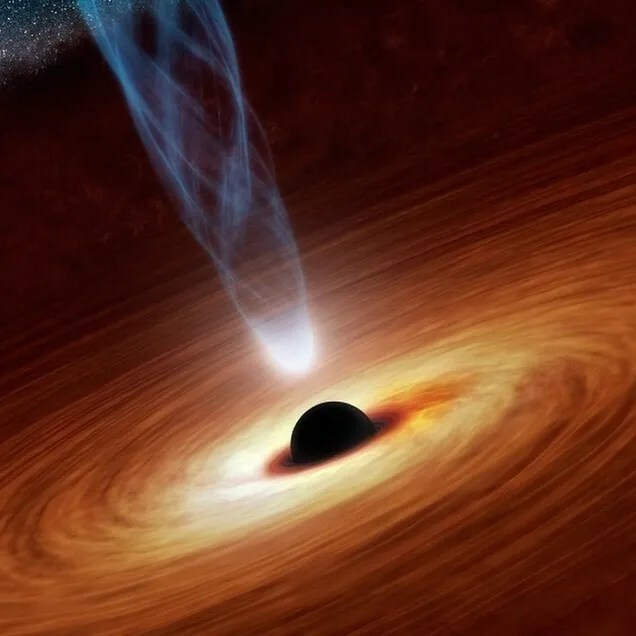 A free black hole game, to help you celebrate Black Hole Friday in style! 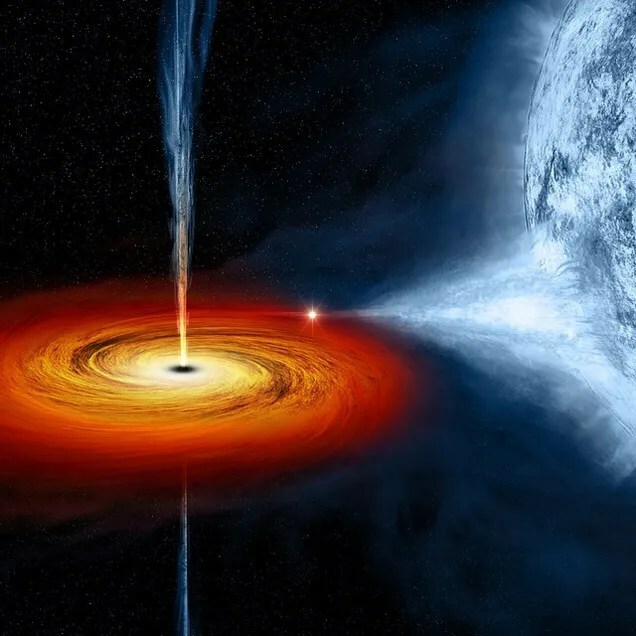 So what’s your favorite black hole artwork or other image? Engineers in the U.S. have shown that graphene — a remarkable material that’s only 10 to 100 nanometers thick — could make for excellent body armor, absorbing 10 times the amount of energy than steel before failing. Since its discovery in 2006, graphene has been hailed as the next big thing in materials technology. At a mere one atom thick, it is incredibly flexible,eternally stretchy, conductive, and self-cooling. Eventually, graphene could be used to produce video screens as thin and flexible as paper, super-thin cybernetic devices that can be grafted onto living tissue, and electrically conductive transmitters that can repair damaged spinal columns. 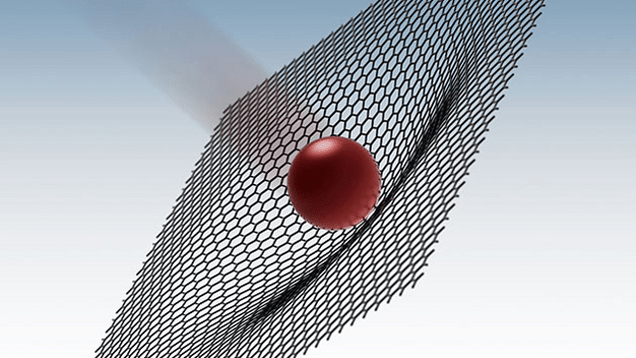 But it now appears that graphene can also be used to create super-strong body armor. 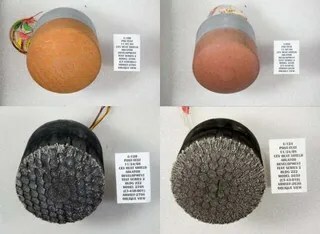 A team from Rice University recently became the first to subject the material to the extreme conditions of high speed ballistics. But because the size of the graphene patches is still so small, a laser was used to accelerate a microscale silica bullet at a multilayer graphene target. The bullet was propelled into stacked graphene sheets at supersonic speeds of up to 2000mph by the gases produced by laser pulses rapidly evaporating a gold film. The team calculated the energy difference of the bullet before and after to determine the energy absorbed. Neil Bourne, director of the National Centre for Matter under Extreme Conditions in the UK, who was not involved in the research, described the technique as ‘very exciting’. ‘They have taken a standard laboratory ballistics configuration and demonstrated its utility on microscopic scales,’ he says. Graphene was able to absorb up to 0.92MJ/kg of ballistic energy in the test, with cracks forming around the impact zone. By comparison, steel targets only absorbed up to 0.08MJ/kg at the same speed. ‘The game here is energy absorption,’ says Edwin Thomas, Lee’s colleague and Dean of Engineering at Rice University, US. ‘If you can nucleate many cracks, it is a way of spreading the impact into more material.’ Thomas likened the effect seen in graphene to that of tempered safety glass, a material engineered to spread damage and not locate it to a point. Graphene’s dynamic strength, argue the researchers, is significant as it may behave similarly in materials specifically engineered to stop bullets, including kevlar — a fabric composed of aromatic polyamide threads. 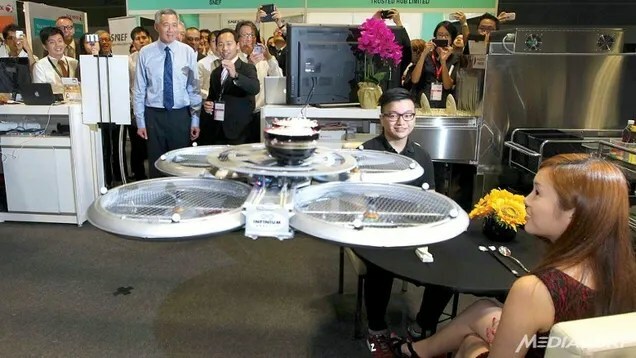 Flying quadcopters are scheduled to start serving customers in Singapore restaurants by the end of next year. Sounds great, but do we still need to leave a tip? The autonomous quadcopters from Infinium-Serve are expected to be launched in late 2015 at one of Timbre Groups five outlets in Singapore. Given how dangerous these things can be at the hands of an inexperienced controller, and keeping in mind that customers can unexpectedly get in the way of one of these things, I can’t even imagine the insurance costs being incurred by these restaurants. NASA is dreaming big and working hard. Orion is the result, the first step in opening up deep space exploration to humans — and hopefully, bringing people to Mars. The spacecraft undergoes its first test flight next week, and here’s everything you need to know about it. The largest rocket on the planet is about to carry NASA’s dreams into a highly inclined orbit around the Earth. Exploration Test Flight-1, the first uncrewed full-system test flight for the new Orion spacecraft is December 4th. Here’s what it is, why it’s awesome, and how it’s the first step inNASA’s Next Giant Leap. Orion is the crew exploration vehicle being developed by NASA for deep space missions beyond Earth orbit. The basic design is familiar from other space projects, but super-sized and with more sophisticated technology than anything that came before. In the past few months, we’ve been tracking as it was assembled and rolled out to the launch pad in preparation for its December 4th test flight. As we await its epic trial by fire during Exploration Test Flight – 1 (ETF-1), it’s time to run down what this spacecraft is, how it works, and why it has NASA dreaming of incredible futures. 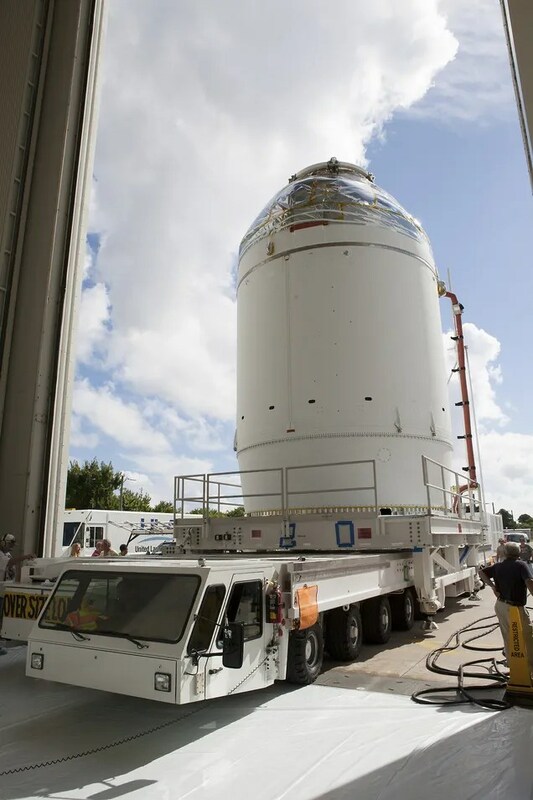 The Orion Spacecraft Is Almost Ready For Testing! Like all NASA projects, Orion’s mission has been blown by the budgetary winds. It was originally announced as the Crew Exploration Vehicle back in 2004 by President Bush in the wake of the explosion of space shuttle Columbia. Intended for cargo and crew service the International Space Station along with a return-to-the-moon mission, it superseded the orbital space plane concept that had previously been under development. Since then, the project focus has switched. While it should technically still be able to perform emergency crew transport services to the International Space Station if every other option fails, the focus now is for deep space projects beyond the Earth-moon system. The spacecraft is currently composed of the crew module, service module, launch abort system, and parachutes. By itself, it should be able to support up to six astronauts for just over twenty-one days. 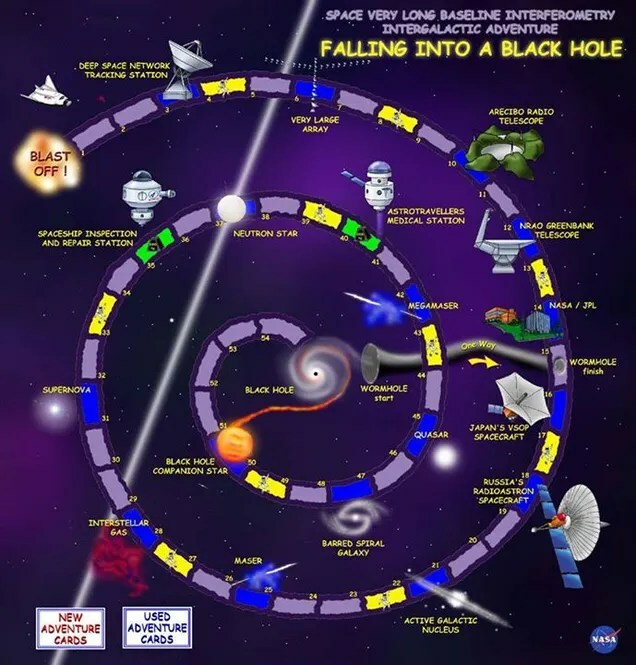 For future longer-duration deep space missions, it will be mated to a larger complex that has yet to be designed. In this quiescent state where life support is provided by the yet-to-be-built module, it should be capable of supporting astronauts on a mission up to six months in duration, the length of a typical stay on the International Space Station. 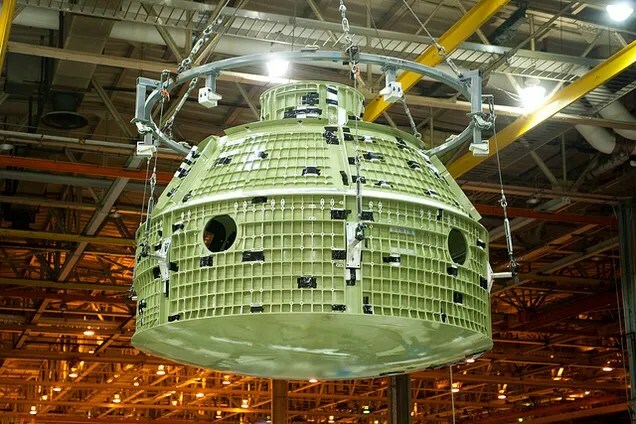 To accommodate technology improvements over the development and use lifespan of the spacecraft, Orion is designed so that the life support, propulsion, thermal protection, and avionics systems are upgradable. Eventually, Orion will be launched from the biggest rocket ever built, theSpace Launch System (SLS). It’s not done yet, so for now, Orion is hitching a ride into space on United Launch Alliance’s Delta IV Heavy rocket. 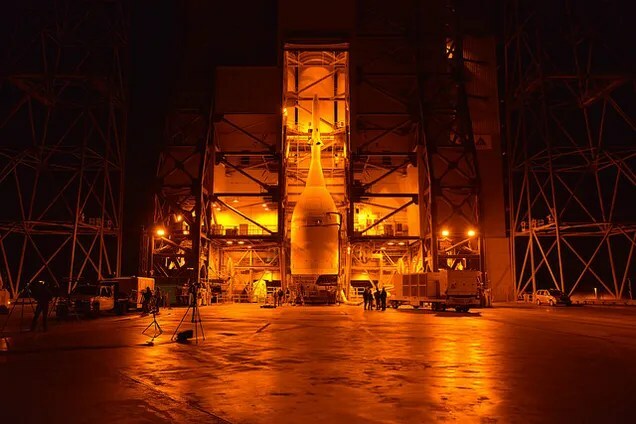 As the Delta IV is the most powerful rocket currently in production with just the main engine producing over 700,000 pounds of thrust, Orion is still taking advantage of rocket-power superlatives even for the earliest test flights. 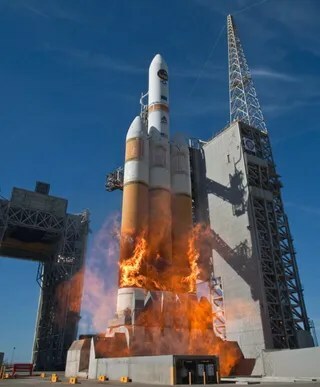 The Delta IV Heavy is a massive workhorse of a rocket. It also has an unnerving tendency to catch on fire during launch, but in a purposeful, “No, we meant to do that” way. This is because a bit of liquid hydrogen leaks out during the launch sequence, catching fire during ignition. The fires can be intense enough to even leave the booster cores smouldering and charred, further enhancing the feelings of impending doom. To increase safety during launch, Orion marks the return of a launch escape system like those seen during the Mercury and Apollo missions. If something goes horribly wrong in the first few moments of flight, theLaunch Abort System will activate to carry the crew module and its squishy astronauts away from imminent catastrophe at transonic speeds. (Although in this first uncrewed test flight, no squishy astronauts will be on-board in need of a rescue.) Built byOrbital Sciences, the Launch Abort System consists of three motors: a launch abort motor, an attitude control motor, and a jettison motor. The launch abort motor is a solid rocket with more thrust than the Atlas 109D that carried John Glen around the Earth for the first American crewed orbital spaceflight. The solid rocket motor is built by Alliant Techsystems, and is the powerhouse of the Launch Abort System. In the worst-case scenario, it can activate within milliseconds to exert up to 400,000 pounds of thrust, carrying the crew module free of impending doom. This is enough to carry the rig to an altitude of approximately one mile, flinging astronauts to safety. The attitude control motor, also manufactured by Alliant Techsystems, is a solid-propellent gas generator used to steer the system. Eight vents equally-spaced around the motor combine to exert up to 7,000 pounds of steering force. 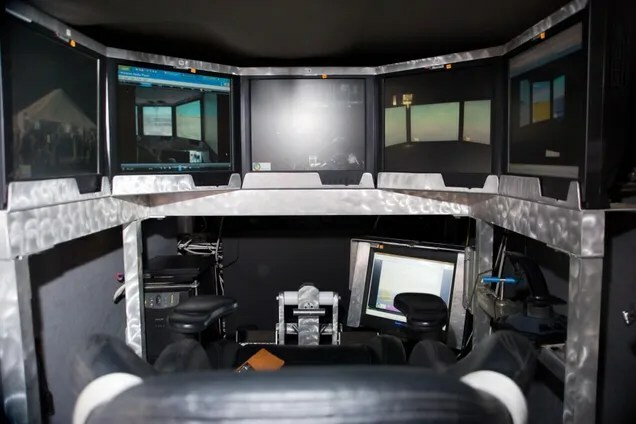 It can be used to steer the abort system in any direction necessary to direct the crew module free of any exploding wreckage, and position it for a safe landing. Aerojet Rocketdyne’s jettison motor is the one component that will be used in successful launches. If all goes well, it will fire to pull the Launch Abort System away from the rest of the rocket. This is a necessary step not just to shed excess weight, but because otherwise the Launch Abort System fully blocks the parachutes necessary to slow Orion down before splashdown. The entire Launch Abort System was tested together in 2010 at White Sands Missile Range in New Mexico. For Exploration Test Flight – 1, only the jettison motor will be activating as part of the tests to prove that each of the component systems function as an integrated spacecraft. 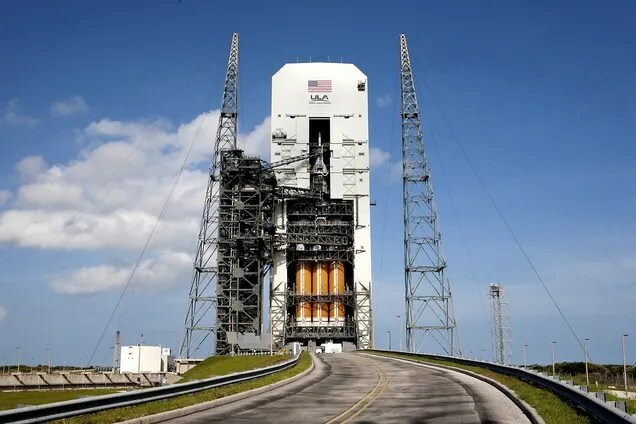 The entire Launch Abort System won’t be tested together again until Ascent Abort – 2, when it will be mounted on an Orion mock-up and launched by the first stage of a Peacekeeper missile at Cape Canaveral. This test will take it up to Mach 1, reaching the aerodynamic limits under which it is expected to perform. This will be the final test of all three motors before the system is used on human-crewed test flights. The core of the Orion spacecraft is a crew and a service module. The crew module is where astronauts will hide (although this first test flight will be uncrewed), and the service module carries all the essential bits that make this a spacecraft and not a tin can in space. Both modules are constructed of an aluminum-lithium alloy, the same material used for the external tank for the space shuttles, the Delta IV rocket, and the Atlas V rocket. Reading through the tech specs for these modules is a mix of history lesson and affirmation that science and technology builds on what came before: so much of the Orion spacecraft is an echo of other projects, but new, improved, and tweaked to be bigger and better than the originals. While this first test flight will be uncrewed, humans will eventually be crowded into the crew module. The crew module is a cone-shaped nub that is visually extremely similar to the Apollo capsules from the moon missions. The crew module was built by Lockheed Martin, and borrows significantly from earlier projects. It’s about 5 meters diameter, making 50% larger by volume than Apollo. 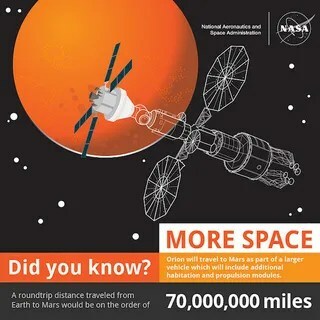 At 2.5 times the habitable space of Apollo, it will be capable of carrying 4 to 6 astronauts of a much wider range of heights than accommodated by modern spacecraft, and is the only part of Orion intended to return to Earth. The module will carry crew, research instruments, and any consumables for the duration of the mission. 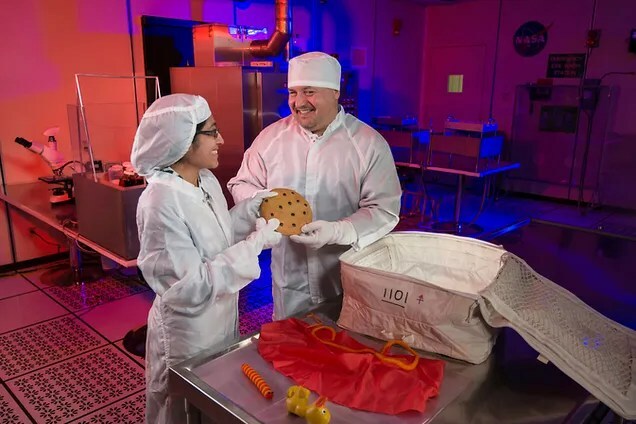 Unlike Apollo and its notorious plastic baggies, it will feature a better waste management system with a camping-style toilet and relief tube similar to systems used on Skylab, Mir, Soyuz, and the International Space Station. Along with the Launch Abort System, astronaut safety is also increased by fitting the crew module with a fibreglass Boost Protective Cover to increase aerodynamics for the first 2.5 minutes of flight. Between these systems, NASA is claiming that Orion will be ten times safer during launch than the space shuttles ever were. The module will be controlled by a glass cockpit design derived fromBoeing’s Dreamliners. This means the control system will be electronic and digital displays on LCD screens, not analog dials or gauges. This allows for greater automation, accuracy, and integration between controls and readouts than traditional systems. It also makes the readouts easier to read under stress while reducing the number of mechanical parts that can break and cause false readings. Orion’s glass cockpitcan even include feedback loops and self-checks, automatically alerting pilots of impending problems before they’re an emergency. The module has a docking port, so will also be where the spacecraft will attach to other craft in orbit. 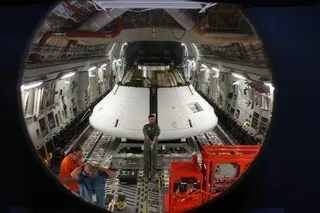 Unlike the space shuttle’s fully-manual docking, Orion’s crew module will incorporate automated docking akin to Russia’s Progress spacecraft, and the European Space Agency’sATV cargo tug, with an option for emergency crew-override. 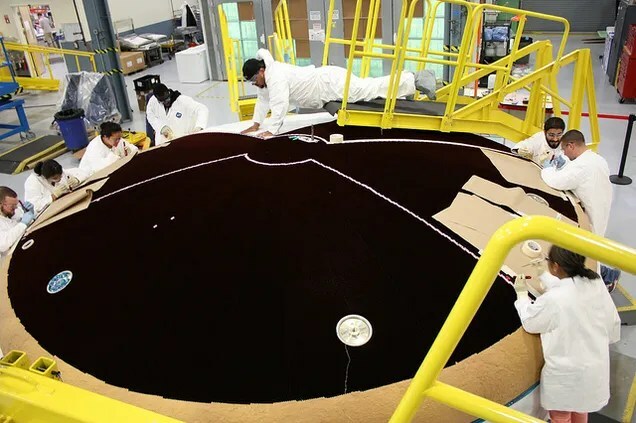 The thermal protection system consists of a heat shield for the areas that will bare the brunt of atmospheric friction during reentry, and a thermal blanket to coat the rest of the spacecraft. The ablator heat shield is the next generation of AVCOAT used on Apollo, a honeycomb of silica fibres and resin updated for modern environmental codes. Anywhere that isn’t subject to critical heating will use a Nomex thermal blanket. This is exactly the same way the thermal blanket was used on the space shuttles around places like the bay doors, fuselage, and upper wings. It’s also been field-tested by protecting the Galileo spacecraftand theHuygens probe during deep space missions. Originally planned to return to Earth on land swaddled in airbags, the crew module was swapped over to splashdowns as a weight-saving design change. This had a carry-on effect of meaning that the crew module couldn’t use a new green fuel, but instead would need to rely on hypergolic fuels that will break down in salt water in the event of a spill. With a bit of luck, the crew module will be semi-reusable: each module should make it through ten missions before being retired. The service module is a cylindrical tube holding all the dull-but-important things: the propulsion systems and expendable supplies. “Expendable supplies” is the nicely oblique way of referring to something utterly essential for human spaceflight: oxygen and water. Built by the European Space Agency, the design borrows heavily from the now-retired Automated Transfer Vehicle (ATV) cargo modules. The in-flight propulsion system is bi-propellant rocket engine made by Aerojet Rocketdyne capable of generating 7,500 pounds of thrust. The service module will also borrow from other modern spacecraft, wearing a pair of deployable solar panel wings. This cuts down on the need to pack in heavy, unreliable fuel cells, further streamlining Orion to be as light as safely and functionally possible. The service module also has an unpressurized cargo space. It will be enough to bring bits and pieces for astronauts to actually get some science done whenever they get to where they’re going. This first test flight is going way beyond our regular jaunts to Low Earth Orbit, so Orion will be coming back to Earth at nearly 80% of the speed it would reach on the return from a lunar-captured asteroid mission. BecauseEarth has such a delightfully thick atmosphere, using atmospheric friction and a sturdy heat shield will be enough to drop the speed from truly outrageous to merely unreasonable. After that, it’s up to a system of parachutes to further slow the spacecraft to something a bit less life-threatening so it can splash, not crash, into the Pacific Ocean. 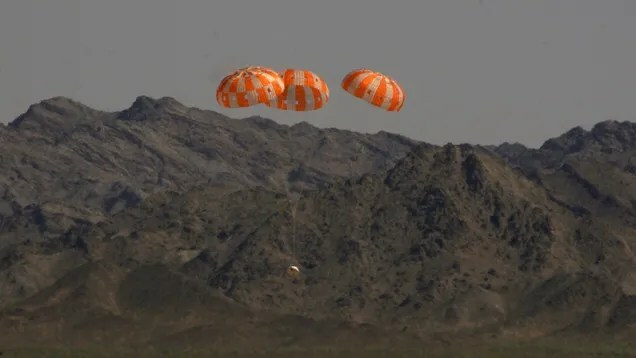 After atmospheric friction drops Orion’s velocity to a reasonably outrageous number, parachutes will deploy to slow the crew module even further. The parachute system for Orion isn’t just one parachute: it’s a whole series of parachutes set to deploy is . is a staggered pattern to slow the craft. Quite a few parachute tests have taken place over the past few years. Engineers have deliberately screwed with the deployment schedule to see how badly things would fail, increased the maximum pressure the spacecraft could possibly exert, and otherwise torment the thin, strong sheets. Sometimes the tests went well and the parachutes still managed to slow the craft before it crashed into the Arizona desert. Other times, less so. In the most recent and complicated tests using a full-scale weight-appropriate model for the crew module, the parachutes performed flawlessly. The test rig was dropped from a C-17 cargo plane 35,000 feet above the U.S. Army’s Yuma Proving Ground in Arizona and left to free-fall for ten seconds to build up velocity and aerodynamic pressure before popping the protective covers and deploying the parachutes. 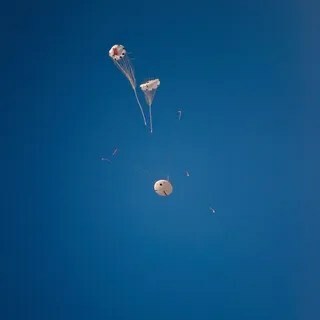 The test engineers even sabotaged the system, setting one of the main parachutes to skip over reefing, going directly from deployed to fully-unfurled. It was the first time some of the parachutes had been tested at such a high altitude, yet they all worked great. 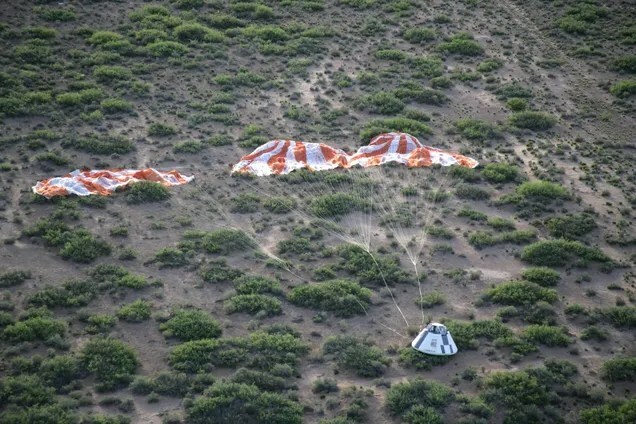 For Exploration Test Flight – 1 returning Orion from Earth orbit, the parachutes will engage after atmospheric friction has slowed the spacecraft down to a still-insane 300 miles per hour. 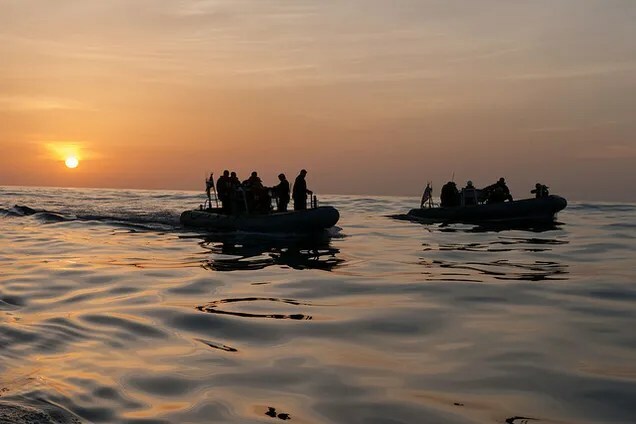 Two drogue parachutes and three main parachutes will deploy to slow the craft to a less teeth-jarring 20 miles per hour before it splashes down in the Pacific Ocean. Exploration Test Flight 1 is on-schedule to blast off on December 4, 2014. This uncrewed test flight will be the first integrated system test to ensure all the system components can function together as a functional spacecraft. The high-apogee test flight will take the spacecraft to approximately 3,600 miles altitude, over fifteen times Low Earth Orbit where astronauts hang out on the International Space Station. This will be the first realistic test for the various components: no matter how harshly we test things on the ground, we just can’t match the everything a true space environment does to equipment. The test flight will be used to collect data critical to dropping 10 of the top 16 risks identified that would endanger astronauts during future test flights. It will also be a chance to identify areas where engineers can tighten up efficiency for future production, and will build experience capacity for the operations teams. This isn’t an unprecedented cargo: we have a habit of loading commemorative goodies onto flight manifests. Mercury astronauts tucked dimes in their spacesuits, Apollo astronauts carried family photos and stamped envelopes, and space shuttle astronauts carried a tiny package of whatever was most meaningful for their lives. Most recently, Reid Wiseman carrieda tiny giraffe from his daughters and a series of wristbands honouring friends dealing with childhood cancer, and Terry Virts packedOlaf in his bags. We even do it with our robots, sending Voyager out with the Golden Record, and equipping Curiosity with a penny for camera calibration. Assuming everything goes well during December’s test flight, the next major milestone tests will be in 2017 for Exploration Mission-1 (EM-1), another uncrewed flight taking Orion on a circumlunar trajectory. By 2021 or later, Orion will start carrying humans with the start of the crewed test flights with Exploration Mission-2 (EM-2), currently intended to carry astronauts to visit a captured asteroid in lunar orbit. After that, it’s time to start getting serious about picking an objective for a deep space mission: a return to the moon, asteroid capture, or something else to support an eventual human presence on Mars. We’ll be keeping the Orion coverage going as we count down to the test flight, with more details as to what to expect and how to follow along. All hyped up about the Orion test flight on December 4th? Build yourself a paper model to decorate your desk or run a flight test at home, ordownload the alphabet colouring book to colour your way through Orion from A to Z. 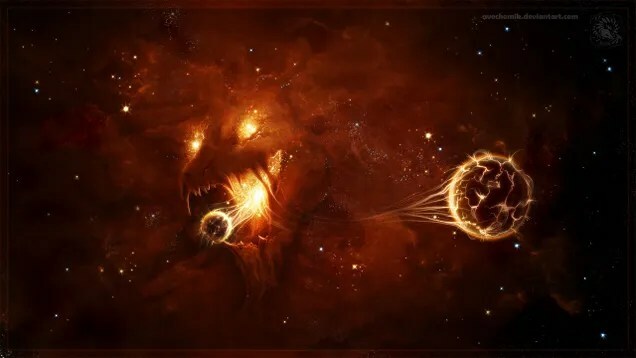 The warning signs were all there: the slow accumulation of orange gasses visible at night, the gradual brightening of the two spots that will become eyes, and the dark clouds and energy nets that surround your home planet. The myths were right and the earth is doomed. This is Worlds Eater by AverrisVis at deviantART. See more art here.